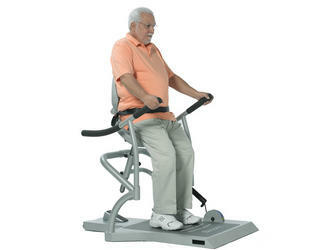 Strengthening both upper and lower extremities, important for maintaining independence. Increase strength. Improve balance & mobility. Sit-to-Stand… the most fundamental motion for functional independence. Preserving the ability to rise from a seated position is crucial for maintaining independence. The Sit2Stand Trainer is easy to use with conveniently located adjustment levers for seat height and assistance, and biomechanically positioned arm supports. Wellness members can utilize the device with minimal supervision, strengthening both upper and lower extremities, important for maintaining independence. With attention to detail in the biomechanics of the sit-to-stand motion and the therapy process, the Biodex Sit2Stand™ is designed to allow the therapist full access to the patient to train and reinforce strategies for the sit-to-stand motion while providing the patient a safe environment. 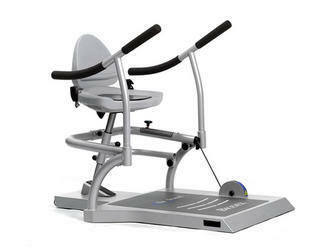 By varying seat height and foot position, the patient will learn the effects of body position and joint angle to control center of mass and the role of momentum in rising.3 The large, comfortable contoured seat with pivoting backrest articulates naturally to correspond with pelvic tilt during sit-to-stand motion. Adjustable start and end seat position accommodates varying amounts of hip flexion and orthopedic conditions. She Loves The Biodex Sit2Stand Trainer. 1 Lomaglio MJ, Eng Janice. Muscle strength and weight-bearing symmetry relate to sit-to-stand performance in individuals with stroke. Gait & Posture 22(2005) 126-131. Assistance Selector – An exclusive Biodex design that provides graded concentric and eccentric exercise throughout the sit-to-stand motion. The system also provides the option to perform gentle, progressive plyometrics for developing fast-twitch fibers which are so important for older adults. One-Touch Assist Control – Provides 15 levels of weight-bearing assistance ranging from 5 lb to 250 lb. Contoured Seat with Supporting Backrest – The large, comfortable seat articulates naturally to correspond with pelvic tilt during the sit-to-stand motion. 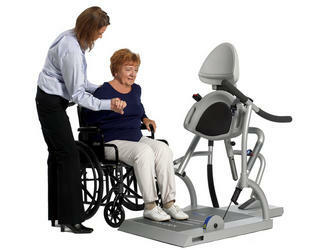 Wheelchair Accessible – The specially designed platform safely accommodates patient transfers. 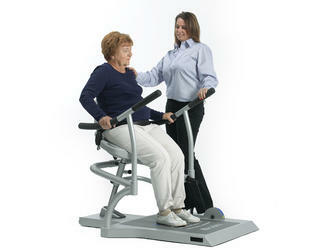 Arm Supports – Contribute to upper extremity strengthening and can be moved out of the way for easy on/off access. Adjustable Seat Height – Seat height is fully adjustable to suit varying patient leg length and height, hip movement and orthopedic conditions. Indexed Foot Base – A foot placement grid provides clear reference for therapists to easily communicate and continually repeat correct foot positioning. Retractable Stabilization Belt – The fully adjustable belt provides a secure environment for patients with limited torso control. Range-of-Motion Limiter – Allows for two starting positions to accommodate users with limited range of motion. Easy to use with conveniently located adjustment levers for seat height and assistance, and biomechanically positioned arm supports. Wellness members can utilize the device with minimal supervision, strengthening both upper and lower extremities, important for maintaining independence. Provides a safe setting for a patient to move through the seated to standing motions, either independently or with a therapist’s guidance. By repeating the motions, a patient builds both lower and upper-body muscular strength and endurance, improves flexibility and ultimately gains independence. 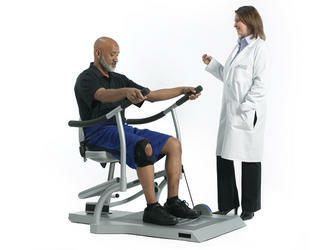 The Biodex Sit2Stand Trainer Helps You to Help Them. Trunk flexion – the momentum allows for a weight transfer to initiate the lift off. Lift off and extension – pelvis moves from an anterior to posterior tilt, and the lower extremity extensor muscles of the ankle, knee and hip are all progressively engaged as needed by the counterforce. Stabilization – reach a stable, upright position. 4 Schenkman M, et al. Whole-body movements during rising to standing from sitting. 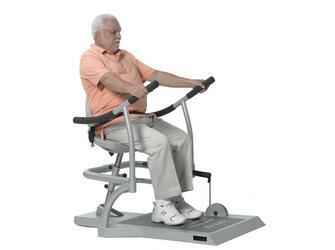 Ideal for strengthening the lower extremities of weakened, older, or sedentary patients/residents, or for cardiac rehabilitation, where standing from a seated position without reliance on the upper extremities is crucial. The assistance profile of the Biodex Sit2Stand corresponds with the sit-to-stand force output providing more assistance where one is weaker, and less assistance where one is stronger. Adjustable: Seven preset increments accommodate patients of various heights.